Durable Medical Equipment (Crutches, Splints, etc. ); this service is provided and billed via an outside vendor of NextCare but may be covered by your insurance plan. Services performed by outside facilities will be billed to you or your insurance company separately by the providing institutions (examples include MRI’s, CT scans, and laboratory services not provided at a NextCare location). Membership fees are due prior to the first of every month for membership benefits. NextCare Advantage cannot be used if you wish to bill your insurance for the care you receive at NextCare. If you use NextCare Advantage, NextCare cannot file a claim with any existing insurance. Proof of membership will be provided to you and must be shown at the clinic at your time of service. I have read and understand the membership information above regarding membership benefits and enrollment. 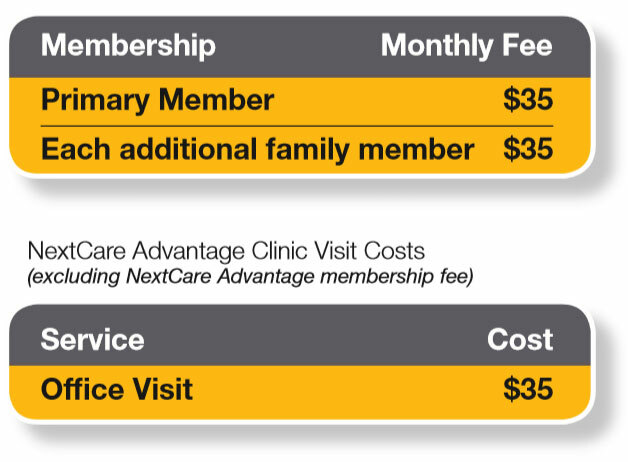 I understand that the NextCare Advantage discount only applies to select services provided by NextCare Urgent Care, and that I will be responsible for any fees, at the time of service, incurred for services outside of the membership program. I also understand that I may never seek reimbursement from any health insurance and NextCare will never bill for services I receive as a NextCare Advantage subscriber. List First and Last Name(s) of members to be covered.